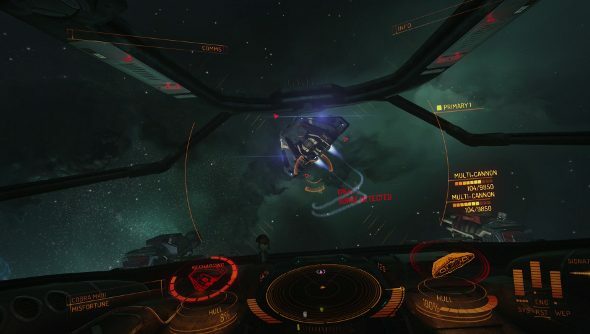 News that the planned offline single-player mode for Elite: Dangerous had been canned led to the typical forum mix of outrage, demands and simple requests for clarification. To clear things up, David Braben went into more detail in regards to what he describes as a difficult decision, in an interview with Eurogamer, while admitting that things could have been handled better. Some thought that killing off offline single-player also meant the death of the story mode entirely, but that’s not the case, it will just be always online. Braben also touched on concerns that players, potential and otherwise, have about their internet connections, and how having a spotty connection or living in an area with poor service might stop them from being able to play. “The existing single-player game does not require a fast internet connection, and is not time critical in the same way as the multi-player,” he said. He did acknowledge that telling the community that the feature had been killed off instead of informing them of the studio’s struggles with implementing it was the wrong move. “In retrospect we should have shared the fact that we were struggling with this aspect with the community, but we were still trying to find a solution. As features were implemented, for the best results we chose to prioritise delivery of the online single and multiplayer experiences, with a view to providing the offline version later in development. We had to make a decision for the good of the game, and that is what we did.